If your child loses or breaks a tooth, they could require urgent dental treatment – and it’s important to get assistance quickly. The first rule of thumb is to always have your pediatric dentist’s emergency number where you can find it at all times. Don’t be afraid to call during the night– that’s what your pediatric dentist is there for. 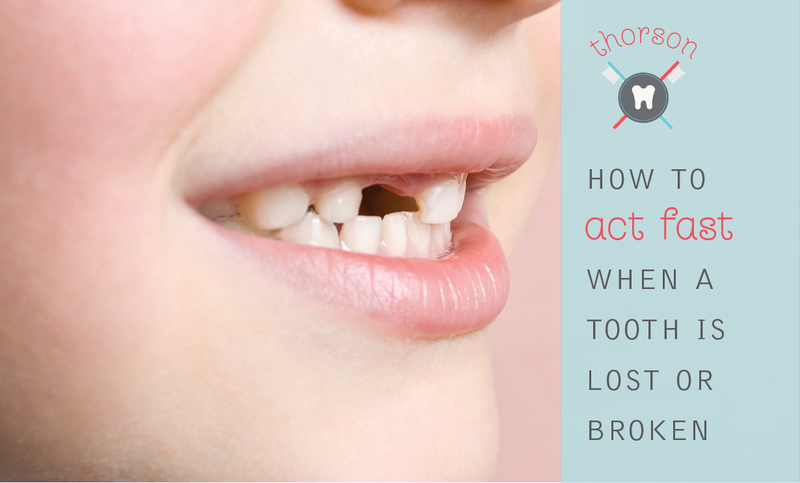 What should you do if a baby tooth is knocked out? You should contact your pediatric dentist as soon as possible. Having said that, baby teeth are not usually replanted because it might actually damage the eruption of the future permanent teeth. Your dentist might even prescribe a space maintainer to keep other teeth from infringing on the space where the permanent teeth will need to come in. What should you do if a permanent tooth is knocked out? Time is crucial in this situation. Find the tooth and gently rinse it off in cold water. This is important. Never, ever scrub the tooth or use soap on it! If possible, replace the tooth in the socket and hold it there with clean gauze or a wash cloth. If you can’t get the tooth back into the socket, place it in a clean container with cold milk or water. Get to your pediatric dentist’s office immediately or, if it’s after hours, call your dentist’s emergency number. The faster you act, the better the chances of saving the tooth. What should you do if a tooth is chipped or fractured? Contact your dental office immediately. Quick action can save the tooth, prevent infection, and reduce the need for extensive dental treatment. Rinse the mouth with water and, if the lip is also injured, apply cold compresses to reduce swelling. If you can find the broken tooth fragment, place it in cold milk or water and bring it with you to the dentist. Remember, if teeth are lost and broken during a jaw fracture or a severe blow to the head, this can be a life-threatening injury. Don’t hesitate – contact an emergency medical team immediately. Keep in mind that emergency medical specialists might be able to reach you much more quickly than you can get your child to the hospital.